Distillation and hydrosols: connecting herbalists to aromatherapy. For a while now, I have been wondering why hydrosols do not play a more important role in both aromatic and herbal medicine. The more I work with them, the more I realize their potential and the more I see them playing a major role in plant healing across the board. One of the most important aspects of hydrosols is that we can make them ourselves and thereby deepen our relationship with the healing plants around us and be more sustainable. Hydrosols are also known as aromatic waters. They are the main product of steam and hydro-distillation, which also yield much smaller amounts of essential oils. Hydrosols can be made from almost any part of the plant: fruit, flowers or flowering tops, leaves, occasionally branches, bark and roots. They can also be made from more unusual substances, such as beeswax and clay. The plant matter is usually distilled fresh in order to preserve the most volatile molecules, prevent degradation due to light and oxygen and to enable the ‘cellular water’ from the plant to be extracted. To me, the best and most important aspect of hydrosols is that you can easily make them yourself, e.g. on your stovetop. This is important, in my opinion, because it gives us autonomy with regards to using and making plant medicine–the more we can do ourselves, and the more autonomously, the better. By making our own plant medicines, we learn to identify the plants we are using. This can also motivate us to grow or wild-craft them, which in itself means that we are building a deeper relationship with the plants and our local environment. Also we connect with the plants in an ongoing pattern, long before we make medicine with them. When making our own hydrosols, we can choose the quality of the plants that we use, either organically grown by ourselves or other people in our community or sustainably wild-crafted in non-polluted areas. We are not reliant on shop-bought products that can be of low quality, degraded, and harvested in an unsustainable manner and in polluted areas. Also, the range of plant products available via stores is generally more limited and generic. Instead, by learning to make our own hydrosols, we can work with and deepen our relationship to our local flora. We can experiment with both aromatic and non-aromatic plants. We can choose the water we use mindfully. 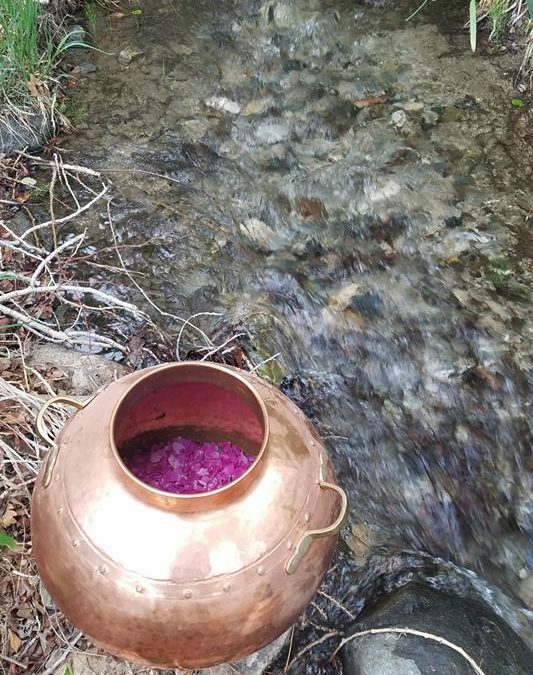 With regards to the water for distillation, make sure it’s from a pure source, such as a spring or well, or even rainwater. We can also offer the respect to the plants that feels right to us and make offerings when we harvest, for a more proper exchange of energy, which influences the potency and energy of the medicines. Also, gathering our own plants gives us the opportunity to take care of the local habitats that we wildcraft from and this mindful attention makes the plants happy. Basically, we are in charge of the process from A to Z, which means that we respect the plant and concentrate on the quality of the medicine we are making from before harvest to using the hydrosol. Hydrosols were used extensively in the 18th and 19th centuries. In fact, they were the predominant form of plant medicine. Due to a number of factors, including that they are less profitable than essential oils, their popularity diminished in the 20th century. With the emphasis on maximizing essential oil yield, hydrosols became a mere by-product of essential oil production, which meant the quality suffered. Distillations were geared towards producing oils and only several highly valued hydrosols such as rose, orange blossom and lavender were available commercially. Centuries of plant medicine wisdom appeared to be headed to extinction. In the past twenty years however, hydrosols have been having a slow but steady renaissance. At-home, stove-top distilling and artisanal hydrosol production are becoming more wide-spread—a quiet revolution in sustainable plant medicine. 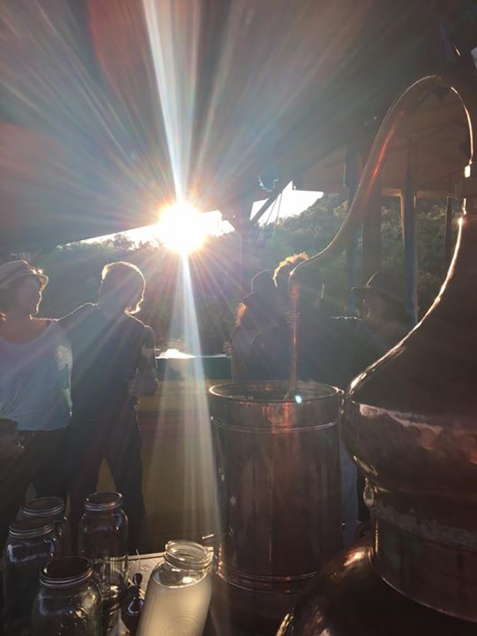 For most of us, home-distilling limits the size of the still, which is usually made from copper, with sizes ranging from 5 to 35 liters (approximately 1.5 to 10 gallons), which is too small for the production of meaningful quantities of essential oils. Yet stills in this size range are ideal for hydrosol distilling, right in your own home, or even in the field. When focusing the distillation on the hydrosol, you can pay much more attention to factors such as temperature, pressure, duration, yield, pH, etc. Therefore you can achieve quality hydrosols easily with your still at home. Still, why hydrosols? I have already discussed the benefits of being able to make them yourself. Even if making medicine isn’t your ‘thing’, hydrosols are nevertheless a very safe, interesting and effective form of plant medicine, that has a long history but has also long been overlooked and undervalued. I highly recommend you become familiar with hydrosols and their healing powers. If you decide to explore hydrosols more, my first advice is to buy them from small-batch artisan distillers or distributors known for the quality of their products. I have always made my own hydrosols. However, last year I was working on my online hydrosol class (see below for more info) and decided to buy a range of commercially available hydrosols to get a sense for their quality. I bought them in a health-food shop in France, choosing a well-known brand and I was really disappointed. Basically, they had no flavor, aroma or energetic resonance. They were flat and lifeless. I could think of at least three reasons for this: First, a hydrosol that is produced during an essential oil distillation is considered a by-product and when aiming for maximum essential oil yield, little attention is given to the hydrosol’s needs and the quality suffers. Second, only the initial fraction of the distilled hydrosol contains enough aromatic molecules to make it aromatically and medicinally potent, but a distiller may keep collecting hydrosol in the distillation to maximize yield, which results in over-dilution of the aromatic constituents. Third, the producer has probably not paid enough attention to the care of and respect for the plant, habitat and harvesting process to retain the intelligence of the plant and its soulful resonance. Unlike essential oils that are highly concentrated, hydrosols are much more dilute, which makes them much easier and safer to use and more sustainable, while still offering healing potency and a wide range of uses. Nowadays most of us are aware of the huge amounts of plant material required to make one liter (approximately one quart) of essential oil. For example, it takes approximately 1300 lbs of Lavandula angustifolia to get a liter of lavender essential oil and it takes the flowers of 2 acres of Damask roses for a liter of rose essential oil. Just think about the environmental impact, especially as more and more people are using essential oils in larger quantities than ever before. The yield of hydrosols is much higher per amount of starting plant material, which makes hydrosols much more sustainable and allows you to make useful quantities in a small home still. Also, hydrosols are much safer, gentler and easier to use than essential oils. They don’t need to be diluted or mixed with a carrier oil. You don’t have to educate people about the dangers of unsafe practices, which has become a growing concern about essential oils. People often think that because hydrosols are much more dilute, they are less potent, but that is not true. Just think of how potent flower essences and homeopathic remedies can be, even though they are even more dilute. The versatility and wide range of actions and uses of hydrosols may seem incredible. Hydrosols are effective and safe home remedies for children. They are also an excellent water-based ingredient for natural cosmetics, adding both aesthetic and healing qualities. They can be added to foods and especially drinks as an interesting and safe ‘magic touch.’ They make great and easy-to-use healing additives to a bath. They can even be added to tinctures and herbal teas to contribute an aromatic element to the medicine. 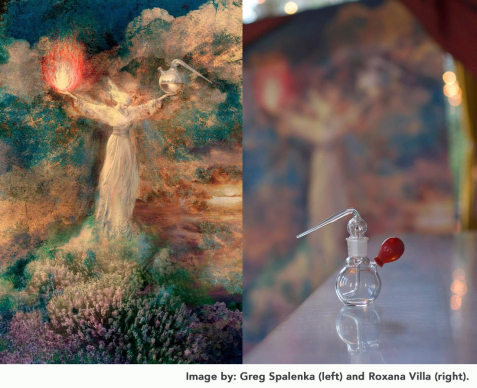 Being more dilute than other forms of aromatic medicines, they also make very powerful tools in vibrational medicine, acting in a similar way to flower essences. In France, my training as a herbalist involved an in-depth training in aromatherapy and aromatic medicine is considered an important aspect of herbalism. I know that many herbalists in English-speaking countries are hesitant to incorporate essential oils into their practice, for several reasons. One reason is an ethical concern about the amount of plant matter needed to make them, as discussed earlier. Another reason is the opinion that without a huge still, you can’t make sufficient amounts of essential oils for your practice yourself and are dependent on having to purchase essential oils. As we have discussed, this is not the case for hydrosols—sufficient quantities can be easily made at home and need very little plant matter. Although yields change with each plant, the general rule is approximately a liter of hydrosol per kilo of plant matter (approximately 1 pint of hydrosol per pound of plant matter). I have noticed in my own work that I have been able to add to my knowledge of a plant by making a hydrosol from it. In that way, I can really discover and work with the aromatic aspect of the plant as well as all its other aspects. When discovering Yerba mansa (Anemopsis californica), the roots of which are traditionally used in herbal teas and tinctures, I decided to make a hydrosol with it. The yerba mansa hydrosol, which I had to make since it’s not commercially available, revealed a profound, hidden aspect of its character, that I would never have discovered otherwise.